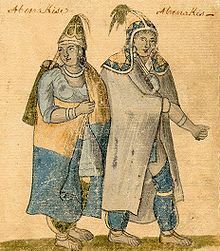 The Abenaki were a farming society that supplemented agriculture with hunting and gathering. Generally the men were the hunters. The women tended the fields and grew the crops. In their fields, they planted the crops in groups of "sisters". The three sisters were grown together: the stalk of corn supported the beans, and squash or pumpkins provided ground cover and reduced weeds. The men would hunt bears, deer, fish, and birds. ^ a b c d "Abenaki". U*X*L Encyclopedia of Native American Tribes. 2008. Archived from the original on 2014-06-11. Retrieved 2012-08-14 – via HighBeam Research.